The answer is Yes! Following is a current list of four major commercial board challenges, published by Deloitte Consulting. The italicized comments show the nonprofit similarities. Many nonprofits facing the risk of financial destruction must chose between focusing financially viable programs and needed programs that can’t carry their costs. A Harvard study estimates that nonprofit fraud loses amount to $40 Billion a year. Regulators and media outlets are focusing on outsized salaries for some top managers, especially where there are nonprofit making and commercial organizations are in the same field, e.g., health care. Increased attention to the expanded form 990 relating to governance and the Intermediate Sanctions Act, relating to excess benefits, are a concern for nonprofit boards. Numerous nonprofit and for-profit reports indicate both type of boards need to focus more on strategic planning. 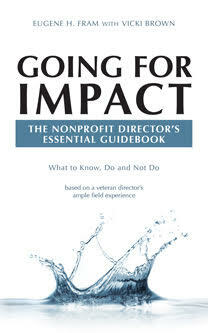 Nonprofit stakeholders, such as foundations, are expecting grantees to show impact results for their financial grants.. Responding to environmental and business sustainability concerns, e.g., whether they are forest conservation or child obesity. ← A Nonprofit Director Board or A Nonprofit Trustee Board?